“An unknown number of North Koreans, possibly as many as 300,000, have defected to China. These brave men, women and children risk their lives to flee the mass starvation and brutal oppression brought upon them by a Stalinist regime. 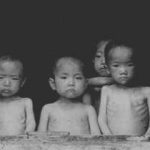 North Korean refugees in China face particularly dangerous and life-threatening consequences if arrested and repatriated to North Korea, including extended detention in prison camps, torture, forced abortions (in the case of North Korean women carrying babies fathered by Chinese men) and public execution. Suffice it to say, the state of human rights abuses inside North Korea spans the issues of injustice, state-enforced poverty, denial of freedom of speech, and denial of religious freedom. An ‘underground railroad’ provides logistical support to guide such refugees to safe havens in countries that border China. When learning of the plight of North Koreans, many feel the need to raise public awareness of the lamentable state of human rights inside North Korea and of the refugees in China.